Great blue heron chicks typically start fledging–and leaving the nests–after about 60 days. Some of the oldest chicks in the Stanley Park colony are getting close to leaving. 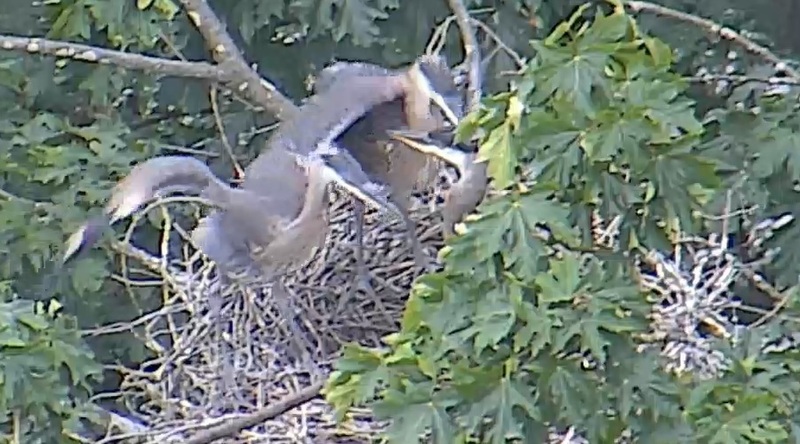 We can tell this when the chicks start to hop to branches near their nest. This stage of development is known as the “brancher” stage and means the chicks will leave in a week or so. In the meantime, the chicks will continue to strengthen their flight muscles by vigorously flapping their wings and practicing short journeys from branch to branch. We expect the first chicks to leave in the next week or so, and more to follow over the next 2-3 weeks. However, there is quite a bit a variation in the age of chicks in the colony right now. The oldest chicks are getting ready to leave, but some chicks are just 3-4 week old. Bald eagles have been regularly seen trying to prey upon young heron chicks this year. They are not always successful, but they have caused a few nests to fail this year. The reason there are still younger chicks to be found in the colony is due to the eagles. 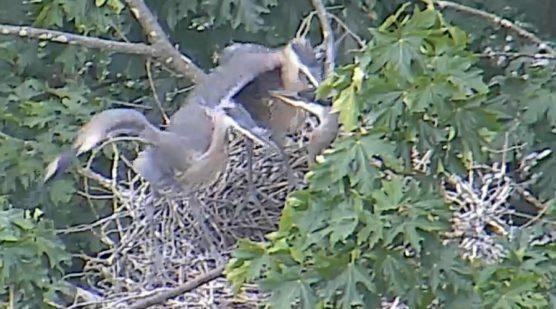 Some of the herons lost their first clutch of chicks and are trying again. You will know that an eagle is near the colony when you hear multiple herons calling out their loud, drawn out, squawking, gurgling, and raspy “aaaawwwwwk” sound. This is an alarm call and can often be accompanied by bill lunges and bill snapping as the herons try to drive away the intruder. A murder of crows usually joins in by diving at and chasing after the eagle too. It is quite a spectacle to witness. 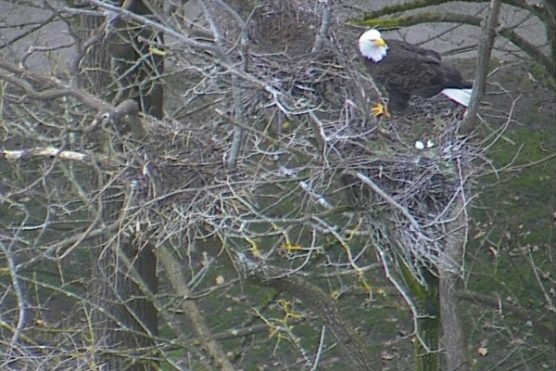 If you cannot make it down to the colony in person, be sure to check out all the excitement on the Vancouver Park Board’s Heron Cam.